Dr. Gerrit Wolf — Director of the Innovation Center, State University of New York, Stony Brook— An industrial and organizational psychologist who has focused on entrepreneurship. His students have started on or joined growing technology-based businesses in New York, where he started entrepreneurship classes 20 years ago; in Budapest, where he held Fulbright’s Alexander Hamilton Chair of Entrepreneurship in 1993; and in Stockholm, where he was the first Fulbright Chair of Wireless E-Commerce in 2001. He and his students have also consulted for a range of firms including Symbol Technologies and Ericsson. He has published more than 60 academic articles on conflict management, managerial decision-making and leadership. He presently researches wireless impact on organizations and consumers. 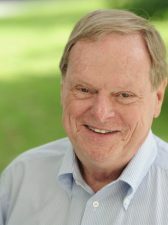 He is a past Dean of the Harriman School for Management and has had academic and administrative appointments at Georgia Tech, University of Arizona and Yale. Dr. Wolf is currently Director of the College’s Innovation Center.